This photo makes the Hell’s Angels look about as threatening as a litter of kittens. Those are Marine special operators in Afghanistan, looking like something akin to a well-organized motorcycle gang. The photo is courtesy of former Staff Sgt. Michael Golembesky, who spent two years with Marine Corps Forces Special Operations Command, serving as a joint terminal attack controller. As Marine Corps Times first reported back in March, MARSOC teams use these small-engine bikes to get around in the Afghan mountains. Before some units deploy, the command sends them through a super-sensitive training program that provides five days of schooling on off-road riding and general motorcycle maintenance. Golembesky published his photos on SofRep.com, a site that tracks U.S. and British special operations news. 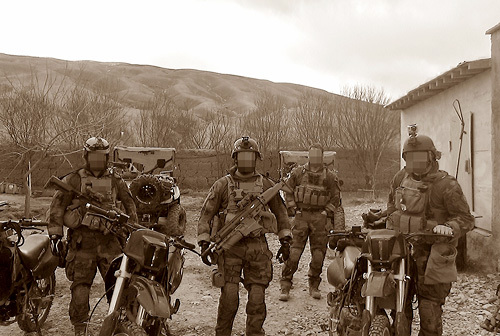 An accompanying narrative describes how Marine special operations teams have been using dirt bikes and ATVs to track down Taliban fighters in the dead of night. The small vehicles allow them to swiftly maneuver in areas where larger vehicles can’t, and the noise they make keeps the enemy guessing by blending in with the sound of local traffic, Golembesky writes. Is it another villager — or one of the world’s most elite warriors swooping in for a kill? 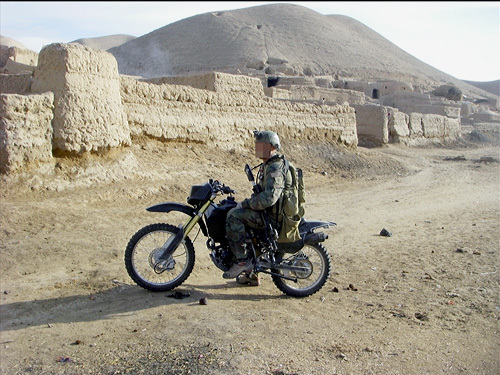 In some cases, where foreign bikes and ATVs are difficult to keep running, MARSOC Marines have used the same small motorcycles that Taliban fighters ride to make quick escapes after planting IEDs or taking potshots at U.S. patrols. Golemesky is writing a book about MARSOC. Titled Level Zero Heroes, the account will examine his experiences in Bala Morghab, Afghanistan, during 2009 and 2010. It is set for release in 2013. Are those DOT approved helmets? Where is their protective gear? Those blurred out faces better have fresh shaves! Now that is a young man’s dream job. Ridin enduros and shooting bad guys, it don’t get much better than that! Okay, that is entirely too cool. Zipping around Afghanistan on a motorbike? Aside from the landmines, insurgents and IEDs, I’m sure it’s just like On Any Sunday. More power to ’em. Ride hard and stay safe guys. I wonder if they ride the diesel Kawasaki KLR650’s. Ian would have fricken loved this!! Obviously not a local for many reasons: -Its clean -Its not 5-10 years old -It’s not a Chinese knockoff of a Honda called “Herang!” and, the big US guns they’re carrying (which are also clean).